What are the causes, symptoms, and signs of common types of noninfectious rashes? What health care professionals diagnose and treat rashes? How do health care professionals diagnose common skin rashes? What is the treatment for a rash? Is it possible to prevent rashes? 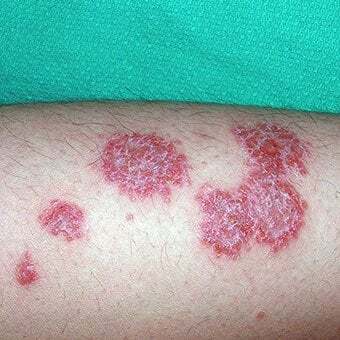 Rash is not a specific diagnosis. Instead it refers to any sort of inflammation and/or discoloration that distorts the skin's normal appearance. Common rashes include eczema, poison ivy, hives, and athlete's foot. Infections that cause rashes may be fungal, bacterial, parasitic, or viral. Over-the-counter products may be helpful treatments for many skin rashes. Rashes lasting more than a few days that are unexplained should be evaluated by a doctor. Some common, noninfectious rashes are listed on the following pages. If you have a new rash and you have a fever or some other generalized illness associated with it, it would be best to see your doctor. Atopic dermatitis, often called eczema, is a common disorder of childhood that produces red itchy, weeping rashes on the inner aspects of the elbows and in back of the knees as well as the cheeks, neck, wrists, and ankles. It is commonly found in patients who also have asthma and/or hay fever. Seborrheic dermatitis is the single most common rash affecting adults. It produces a red scaling often itchy eruption that characteristically affects the scalp, forehead, brows, cheeks, and external ears. In infants, it may involve and scalp (cradle cap) and diaper area. 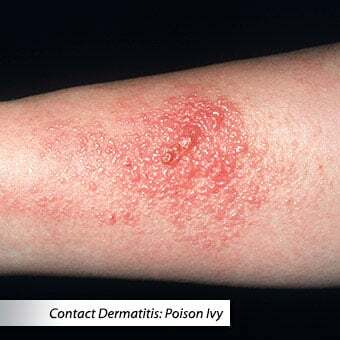 Contact dermatitis is a rash that is brought on either by contact with a specific chemical to which the patient is uniquely allergic or with a substance that directly irritates the skin. Some chemicals are both irritants and allergens. This rash tends to be weepy and oozy and affects the parts of the skin which have come in direct contact with the offending substance. Common examples of allergic contact dermatitis are poison ivy, poison sumac, poison oak (same chemical, different plant) and reactions to costume jewelry containing nickel. This is a weepy, oozy dermatitis that occurs on the lower legs of individuals who have chronic swelling because of poor circulation in veins. This bumpy scaling eruption which does not weep or ooze. Psoriasis tends to occur on the scalp, elbows, and knees. The skin condition produces silvery flakes of skin that scale and fall off. These red itchy bumps come on in a sudden fashion and then resolve in about eight hours. They tend to recur frequently. If hives are caused by a drug, that drug should be avoided in the future. Source: Color Atlas of Pediatric DermatologySamuel Weinberg, Neil S. Prose, Leonard Kristal Copyright 2008, 1998, 1990, 1975, by the McGraw-Hill Companies, Inc. All rights reserved. This skin eruption is caused by the occlusion of sweat ducts during hot, humid weather. It can occur at any age but is most common in infants who are kept too warm. Heat rash looks like a red cluster of acne or small blisters. It is more likely to occur on the neck and upper chest, in the groin, under the breasts, and in elbow creases. Treatment involves moving the individual to a cooler environment. Rashes not caused by infectious organisms, can be treated with over-the-counter 1% hydrocortisone cream for a week or so prior to seeking medical attention. Over-the-counter oral antihistamines like diphenhydramine (Benadryl) or hydroxyzine (Vistaril, Atarax) can be helpful in controlling the itching sensation. Dermatologists, pediatricians, infectious diseases specialists, and many internists are capable of identifying most rashes. The term rash has no precise meaning but often is used to refer to a wide variety of red skin eruptions. A rash is any inflammatory condition of the skin. Dermatologists have developed various terms to describe skin rashes. The first requirement is to identify a primary, most frequent feature. The configuration of the rash is then described using adjectives such as "circular," "ring-shaped," "linear," and "snake-like." 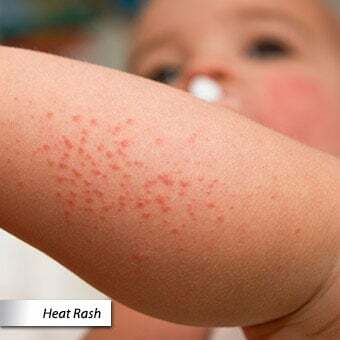 Other characteristics of the rash that are noted include density, color, size, consistency, tenderness, shape, and even temperature. Finally, the distribution of the rash on the body can be very useful in diagnosis since many skin diseases have a predilection to appear in certain body areas. Although certain findings may be a very dramatic component of the skin disorder, they may be of limited value in producing an accurate diagnosis. These include findings such as ulcers, scaling, and scabbing. Using this framework, it is often possible to develop a list, called a differential diagnosis, of the possible diseases to be considered. An accurate diagnosis of a skin rash often requires a doctor or other health care professional. On the basis of the differential diagnosis, specific laboratory tests and procedures can be conducted to identify the cause of a particular rash. Fungal infections are fairly common. Yeasts are botanically related to fungi and can cause skin rashes. These tend to affect folds of skin (like the skin under the breasts or the groin). They look fiery red and have pustules (blisters) around the edges. Fungus and yeast infections have little to do with hygiene -- clean people get them, as well. Fungal rashes are not commonly acquired from dogs or other animals. They seem to be most easily acquired in gyms, showers, pools, or locker rooms, or from other family members. Many effective antifungal creams can be bought at the drugstore without a prescription, including 1% clotrimazole (Lotrimin, Mycelex) and 1% terbinafine (Lamisil). With extensive infection, or when toenails are involved, a prescription drug may be useful, such as oral terbinafine. If a fungus has been repeatedly treated without success, it is worthwhile considering the possibility that it was never really a fungus to start with but rather a form of eczema. Eczema is treated entirely differently. A fungal infection can be independently confirmed by performing a variety of simple tests. The most common bacterial infections of the skin are folliculitis and impetigo. Staph or strep germs may cause folliculitis and/or impetigo, two conditions that are much more common in children than adults. Eruptions caused by bacteria are often pustular (the bumps are topped by pus) or may be plaque-like and quite painful (such as with cellulitis). Rarely, streptococcal sore throat can produce scarlet fever, a rash affecting large areas of skin. Rashes produced by certain classes of bacteria, Rickettsia or spirochetes, Rocky Mountain spotted fever, and secondary syphilis respectively, are often able to be suspected clinically. One of the most common rashes from a parasite infection is scabies. 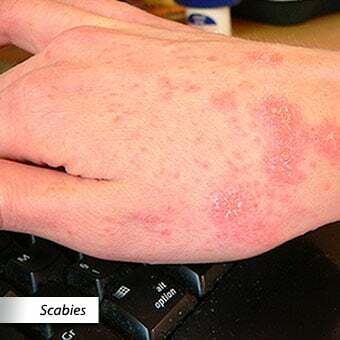 Scabies is produced by a small mite (related to a spider). This mite is usually contracted by prolonged contact with another infected individual. The mite lives in the superficial layers of human skin. It does not produce symptoms until the host becomes allergic to it, which occurs about three weeks after the initial infection. It can resemble eczema. Bedbugs cause a series of eruptions where they pierce the skin. Rashes that characteristically occur as part of certain viral infections are called exanthems. Many rashes from viruses are more often symmetrical and affect the skin surface all over the body, including roseola and measles. Sometimes certain viral rashes are localized to the cheeks, such as parvovirus infections (fifth disease). Other viral infections, including herpes or shingles, are mostly localized to one part of the body. Patients with such rashes may or may not have other symptoms like coughing, sneezing, localized burning, or stomach upset (nausea). Viral rashes usually last a few days to two weeks and resolve on their own. Most rashes are not dangerous. Many rashes last a while and get better on their own. 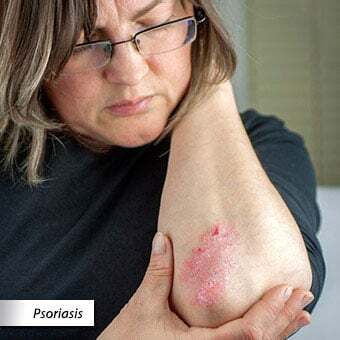 It is therefore not unreasonable to treat symptoms like itchy and/or dry skin for a few days to see whether the condition gets milder and goes away. Oral antihistamines like diphenhydramine and hydroxyzine can be helpful in controlling the itching. Fungal infections are best treated with topical antifungal medications that contain clotrimazole (Lotrimin), miconazole (Micatin), or terbinafine (Lamisil). If these measures do not help, or if the rash persists or becomes more widespread, a consultation with a general physician or dermatologist is advisable. There are many, many other types of rashes that we have not covered in this article. So, it is especially important, if you have any questions about the cause or medical treatment of a rash, to contact your doctor. This article, as the title indicates, is just an introduction to common skin rashes. People with atopic dermatitis or eczema should not be vaccinated against smallpox, whether or not the condition is active. 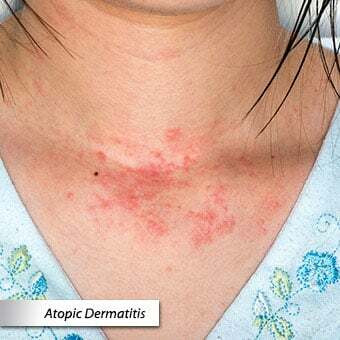 Patients with atopic dermatitis are more susceptible to having the virus spread on their skin, which can lead to a serious, even life-threatening condition called eczema vaccinatum. In the case of other rashes, the risk of medical complications is much less. Consult your doctor about the smallpox vaccine. The prognosis depends on the cause of the rash. An accurate identification is, therefore, of great importance in predicting its resolution. If the cause of a particular rash is known it can be avoided. For example: a measles vaccination would be of great benefit in preventing the rash of measles, as well more serious consequences of measles infections. Bolognia, Jean L., Joseph L. Jorizzo, and Ronald P. Rapini. Dermatology, 2nd Ed. Spain: Mosby, 2008. Rawlin, Morton. "Exanthems and Drug Reactions." Australian Family Physician 40.7 July 2011: 486-489.